I'm using a Gemalto PinPad and the Portuguese eID pteidpkcs11.dll installed with the eID middleware software, located in C:\Windows\System32. I have to build the certificates chain (getSignatureCertificatesChain(ks)) too since ks.getCertificateChain("CITIZEN SIGNATURE CERTIFICATE") only gives one certificate, and then the card itself doesn't have all the certificates so I have to get the missing ones at pki.cartaodecidadao.pt website and put them in a resources folder. Basically, I build my chain using both certificates in the card and in the resources folder, by linking them with the values in certificate.getIssuerX500Principal().getName() and certificate.getSubjecX500Principal().getName() (different cards can have different certificates of the same types, since the validity can vary so in one same type there can be 004 or 008 for example). From what I understood, itext support for CAdES (MakeSignature.CryptoStandard.CADES) is more recent, but you need to use this since using MakeSignature.CryptoStandard.CMS might result in a signature that does not satisfy all the standards for CAdES (for example, missing the signing-certificate attribute - see http://docbox.etsi.org/ESI/Open/Latest_Drafts/prEN-319122-1v003-CAdES-core-STABLE-DRAFT.pdf). should return the certificate chain. Where I can find a working online tool? Suggestion: Make a call to the organization responsible for the middleware and ask for support. Not the answer you're looking for? Browse other questions tagged pdf itext digital-signature or ask your own question. What should be in Xades4J compatible PKCS11 native library? how do I make pdf LTV enabled without using timestamps? 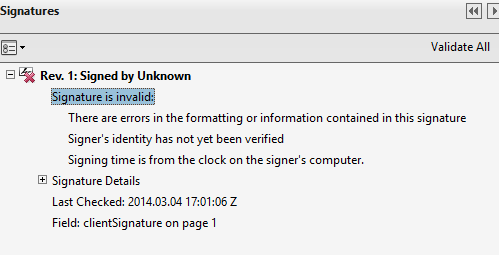 How to sign a PDF with embedded timestamp and LTV enabled?